I appreciate those occasions a prediction hits the mark. 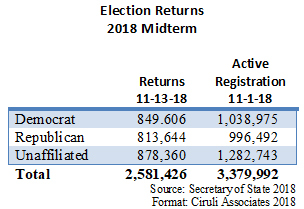 We projected record turnout of 2.5 million in an October 22 blog post, and the most recent count from the Secretary of State reports 2,581,426 midterm votes cast. Nationally, with 61.9 percent turnout compared to eligible voters, Colorado was the second highest state in voter turnout just behind Minnesota. That represents a 76 percent turnout of 3,379,992 active registered voters and 64 percent of total active and inactive registrations. Historically, slightly more than 2 million voters turned out for the 2014 midterm election (71 percent), which had a U.S. Senate race accompanying the usual governor and state constitutional office races. It was a very successful year for Republicans. Republican Cory Gardner won the senate race against incumbent Democrat Mark Udall and Republicans won the three constitutional offices of Attorney General, Treasurer and Secretary of State. They also won one seat in the State Senate and gained control. They lost the governorship with the re-election of John Hickenlooper. But in this year’s high turnout, Democrats dominated Republicans. Thirty-six thousand more Democrats voted than Republicans, but the surprise was the 878,360 unaffiliated voters, which exceeded Democrats by 29,000 voters. High turnout among Democrats, and exceptional unaffiliated turnout, contributed to the Democratic sweep. Colorado’s massive turnout reflected the strong desire among many voters to send a message to President Trump and Washington; the Democratic Party’s well-funded push for voters, especially the unaffiliated and new voters; and a surfeit of competitive, high-profile statewide and legislative races.